40 Years in 40 Days, the History of Les Clefs d’Or Canada. Day 33: Roger Poirier, 1st Member from the Atlantic region. Roger Poirier, Concierge, Delta-Beauséjour, Moncton NB. 1st Member from the Atlantic region. In May 2005, at the Annual General Meeting held in New Orleans, LA, part of the Pan-American Congress, a historic event took place when Les Clefs d’Or Canada had the honor of accepting Roger Poirier as a new Member, the first Member from the Atlantic region. 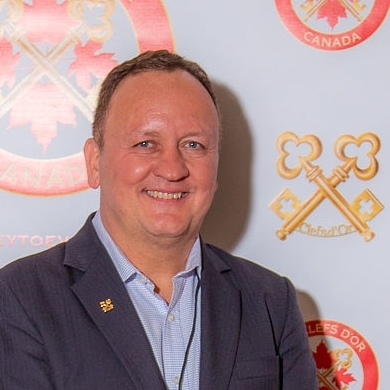 Prior to being accepted as a Clefs d’Or Concierge, Roger travelled frequently to Montreal over a two years period to attend the Montreal Region’s monthly meetings, in order to fulfill the prerequisites of membership and to learn the way LCDC operates. Roger was always proud of the support he received from his management at Delta Beausejour during these years, which was instrumental in his quest for his Keys. Roger’s trailblazing efforts will later lead to the creation of Canada’s 7th Region, the Atlantic Region, confirming Les Clefs d’Or Canada’s representation «from coast to coast», thus making his membership acceptance a truly historic event. ← Day 32 of our 40th Anniversary Celebrations : 2005 – BC Region Participates in our 1st Terry Fox Run!